October 2013 - Bring It! Halloween and Easter are my favorite holidays. The bar is low, family travel is typically not required and the popular traditions surrounding them involve candy. Candy makes people happy. Temporarily at least. 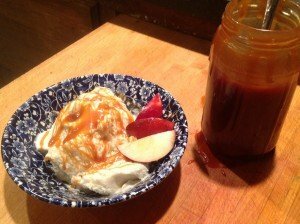 So let’s live in the moment and make some creamy caramel sauce to celebrate Halloween and all the apples just begging to be dipped. This particular golden elixir is a Bring It! all- star. It features only four ingredients, all of which—if not in your kitchen already—can be procured at a mini mart (ok, not the Maldon sea salt, but nobody will arrest you for using kosher salt). It is easy to make, you can memorize the recipe after one go round, it travels in its own storage jar and it will be a welcome contribution or hostess gift for any occasion. Oh, and it is fabuloso! 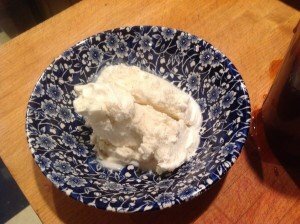 Use it on ice cream and in 2-2/3-3 crepes (coming soon), drizzle it on pretty much anything or use it as a dip for pretzels, apples or just your spoon. As for the name, it is a merging of our three sons’ names. We knew we wanted something to be called Cholliesauce, and after Sawyer took one taste he decided this was it. Ollie and Chauncey wholeheartedly agreed. Ice cream with Cholliesauce: wayyyyyy better! 1. First, make sure you have all of the ingredients ready. Once you start the caramel sauce you have to pay close attention so you don’t burn it. To begin, heat the sugar over medium high-heat in the bottom of a heavy 2-3 quart saucepan. When the sugar starts to melt, start whisking the sugar, making sure to reach into the sides of the pan. The sugar will clump up, but keep whisking. It will continue to melt. When the sugar is melted, stop whisking. You can swirl the pan to move the sugar around. 2. Continue cooking the sugar until it reaches a deep amber color. Make sure you watch the pan very closely. This is where it is easy to burn the caramel. If you are using a candy thermometer (I have tried but am better off eyeing it) you want the caramel to reach 350 degrees F.
3. As soon as the sugar reaches the dark amber color, carefully add the butter. Whisk until butter is melted. If the sugar gets stuck to the whisk, you can switch to a wooden spoon. 4. Remove the pan from the heat and slowly pour in the heavy cream. Whisk until cream is incorporated and caramel is smooth. Whisk in the fleur de sel or Maldon sea salt flakes. 5. Let the caramel sauce cool for about 10 minutes in the pan. Pour the caramel into a large jar or smaller jars and cool to room temperature. Put the salted caramel sauce in the refrigerator and store it there for about a month. Yeah, a month. Good luck with that. This entry was posted in Dessertalicious on October 30, 2013 by Edie Morgan. Fast forward to the night of the dinner party and guests begin to arrive. The “pie guy” shows up with a brown paper bag in hand. He puts the bag on the counter and reaches into the bag. I assume he is going to pull out a full baked pie. Not so. The first thing he pulls out of the bag is a small bag of apples. Next is flour, then butter, sugar, and so on. Is he going to make a pie right here, right now? Is he going to interrupt my carefully orchestrated workflow? After a few minutes of disbelief, I realized, yes in fact, he is going to make the pie right here, right now. Thoughts were buzzing though my head….. how could I avert the chaos that was about to ensue? Before I could make a move, the pie making commenced. Flour was everywhere, precious counter space was gobbled up, guests were moving their drinks to accommodate rolling, chopping, slicing and dicing, and I was trying to remember to breathe! After a few minutes of a rapid pulse and a few beads of sweat I realized, this wasn’t so bad. Nobody cared. And the pie turned out great. So, beware all you hosts out there…. when you ask people to bring food to your house, it can really run the gamut. But, not to worry, all you really need is good friends, good beverages, an open door, and all will be a success! As I mention above, I am not a pie baker, but my blog partner Edie is! 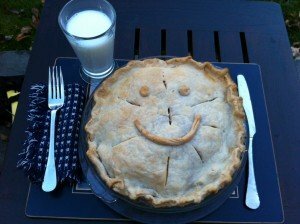 Click here to get a great, and very easy pie recipe. Or, if you are like me, and want all pies to be made by someone else, go to Lou’s Bakery in Hanover if you live in the area. Or find your favorite local bakery and ask them to hook you up. I’ve never been a big fan of the cliché “easy as pie” because it just isn’t true. 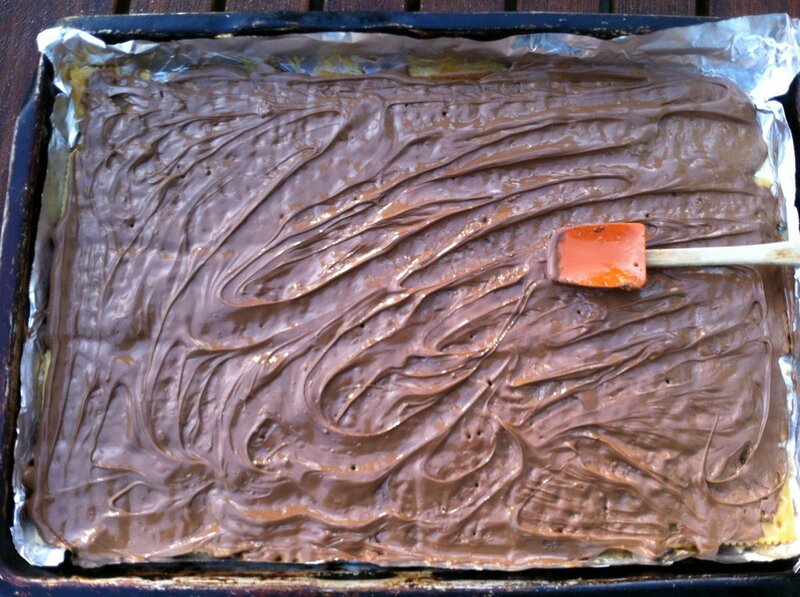 This entry was posted in Dessertalicious on October 29, 2013 by Sue Hanlon. The great outdoors. Sort of at its greatest this time of year. This week we had a bring-it fest—a group hike/farewell celebration with a picnic at the end. I am humbled by the culinary mojo of the women in this community…by their ability to make kale decadent, to transform a meat and cheese plate into a work of art and to master complex desserts that ought to be illegal. More importantly I love that they can bring it all with deftness and grace. My contribution, as often is the case, was in the cocktail family. Also not surprisingly, given the time of year, it involved apples. Say hello to hard cider sangria, the step-down program from all those yummy summer drinks. This came from Food and Wine last October. The only change I made was to triple it, so I could store and transport it in the same big Tupperware I use for freezer daquiris. I liked it so much I made another batch for book group the very next night. Make it with grocery store hard cider and it is pretty sweet. You might want to cut it with some seltzer. 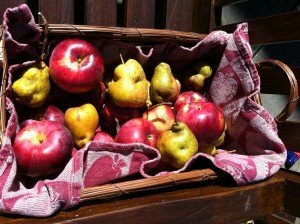 Make it with a really good local hard cider in the wine aisle and it’s a tad more sophisticated (like we care) and less sweet. This recipe has been in my life for four days. Shockingly I have already made it both ways and it’s all good. 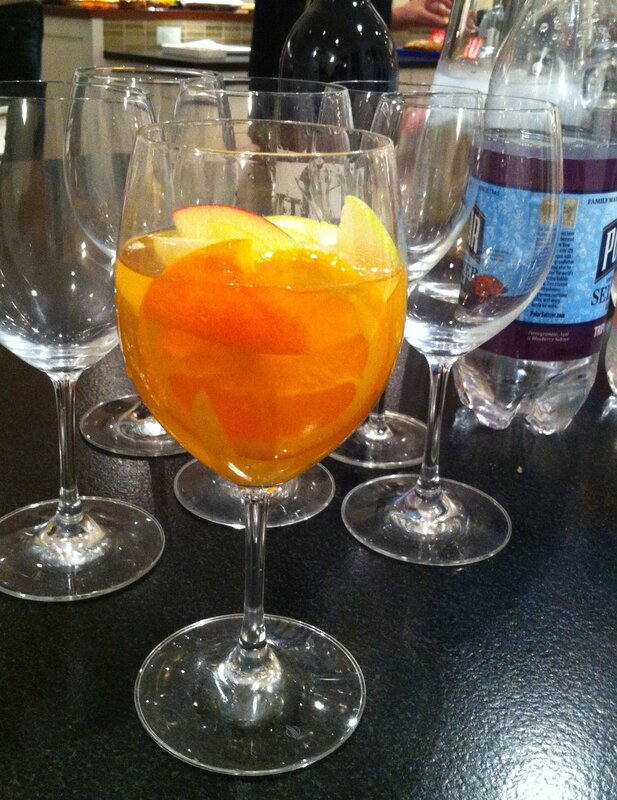 Same sangria, All dressed up for an indoor appearance. A mere peek at a Bring It bonanza! 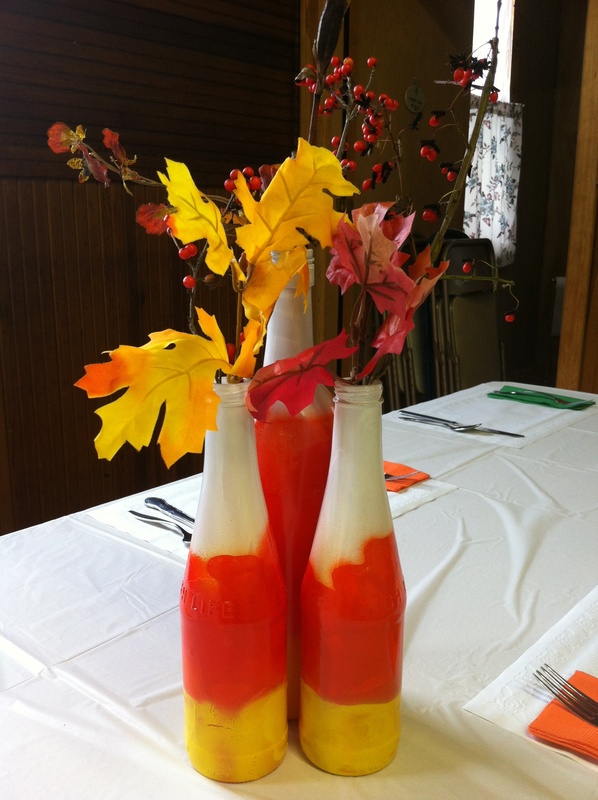 This entry was posted in Sips and Slurps on October 25, 2013 by Edie Morgan. In honor of the first day of the World Series, and the official beginning of crock pot season, I present you with the only pulled pork recipe you will ever need. 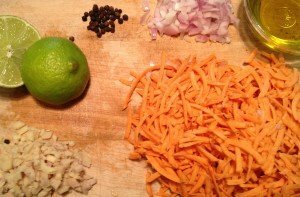 Known elsewhere as “Ultimate Cheater Pulled Pork” via the Splendid Table this recipe is, needless to say, easy. Ridiculously easy. And if you ask the butcher to cut your large hunk of pork into pieces (don’t mention that is it for pulled pork or he/she will try to dissuade you) you won’t have to mess up your pristine (right?) workspace, or even a knife. It’s so darned easy that I rebelled against the effort of making the barbecue sauce, opting instead for any of the dazzling array of bottled sauces. But don’t you know we had nary a capful of bbq sauce in the house tonight so I made the sauce and I think even monkeys could do it. If they were really jonesing for pulled pork, that is. At any rate, it’s good to at least know how to make bbq sauce so I recommended at least trying it once. Oh, if you want to make even more friends serve this with Easiest French Bread Ever or Peoples Choice Cornbread and Hero Slaw. Ok, get the couch ready and find that remote. Here we go! Game Day Pulled Pork As heard on the Splendid Table podcast, and further poached from The Bitten Word. If you want a picture of it look at theirs, because for the life of me I could not get a decent picture of pork. This entry was posted in Main Dishes on October 23, 2013 by Edie Morgan. Bok Choy doesn’t get nearly enough play. It is something that I know I pass by regularly in the vegetable aisle. But if you are looking for something different and want to bring a bright, fun, slightly different salad than the standard mixed greens, this is a great option. It looks so vibrant with the purple, orange, and yellow colors and the flavor of the dressing with the sesame oil and tamari are so good. Also, a healthy option as we head into the holidays! Try it at your next party. Everyone will be asking, “Who made the salad”? 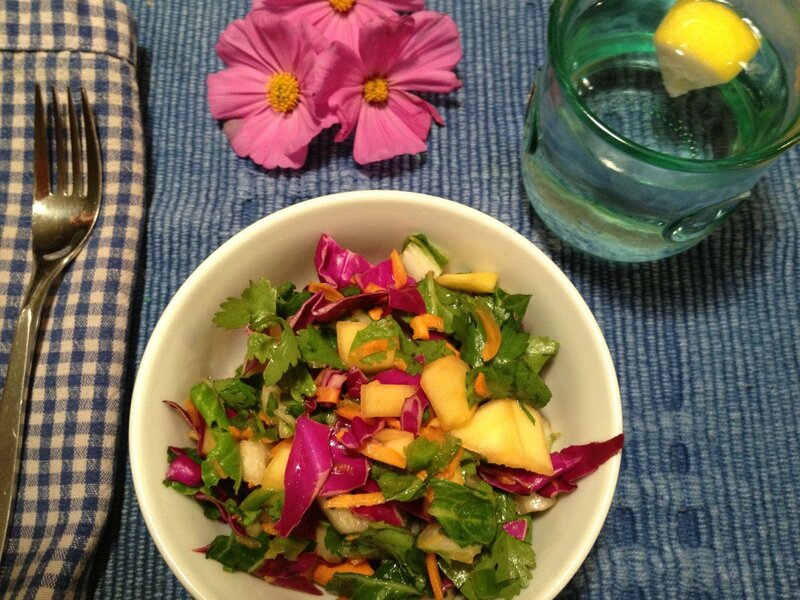 Combine bok choy, carrot, cabbage, mango, jalapeno, and cilantro in a large bowl. Stir together lime juice, agave, sesame oil, and tamari in a small bowl. Pour dressing over salad and mix to combine. Garnish with toasted walnuts. 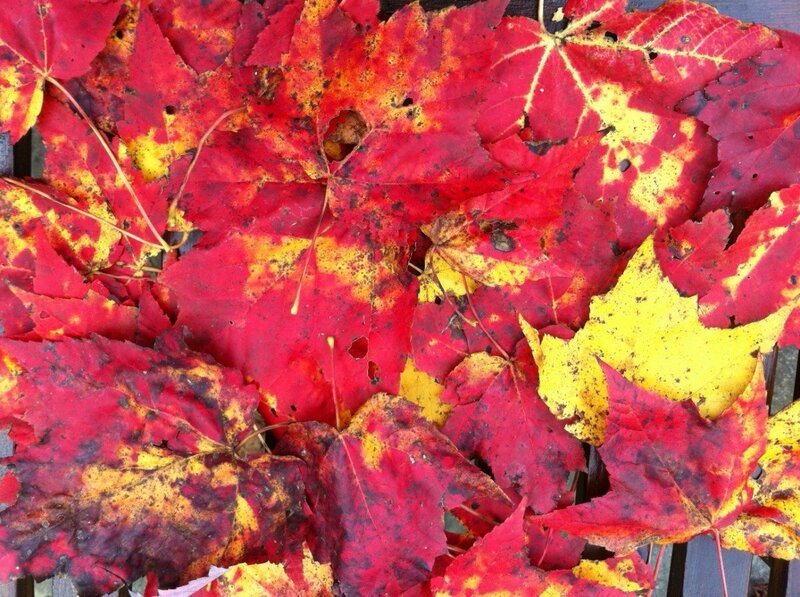 This entry was posted in Salads and Sides on October 21, 2013 by Sue Hanlon. Can you guess what season it is? Yep, tailgate season. 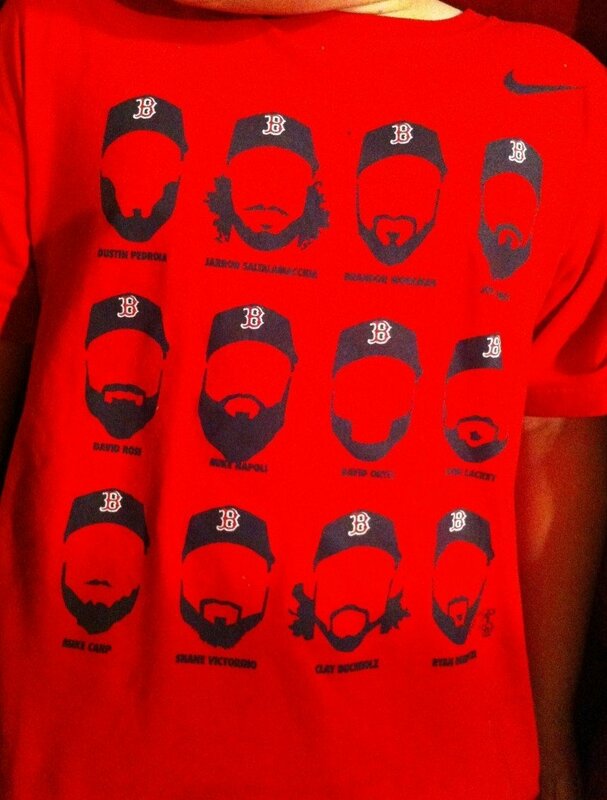 Guess what day it is… No not that. It’s time to think about what you’re bringing to the tailgate or whatever event you are enjoying this weekend. I’m going to make it really easy on you. Bring this cornbread! After bringing it to a party a middle school kid actually sought me out on school grounds to ask how he could find the recipe to give to his mom. Any of you with middle schoolers know the magnitude of this. 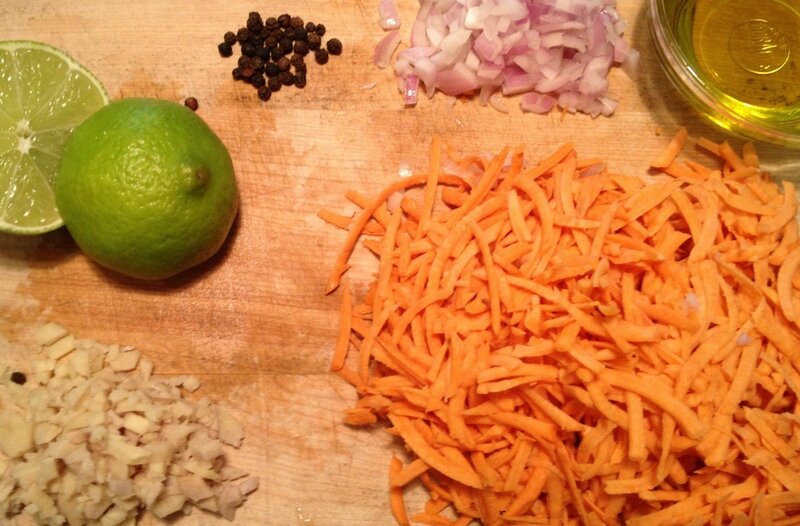 Suffice to say, this cornbread, like Hero Slaw, will make you popular…even in middle school. I first had this, better known worldwide as Blanchard’s Caribbean Cornbread, at a tailgate and was immediately addicted. It’s pretty dangerous that way. You will notice it is most definitely NOT low fat, low calorie, gluten-free or anything like that, which makes it the perfect thing to share (and to not have lying around your own house in any emotionally weak moments). It is an excellent accompaniment to chili, soups, salads or just a glass of milk. And when you’ve had enough, it likes going to school in a lunchbox. Before the recipe, however, a note on tailgates. For some reason tailgates seem to be a hall pass on healthy eating, an excuse to dive right into the goopy wings, crazy multi-cheese dips and bubbly meatballs of unknown composition. 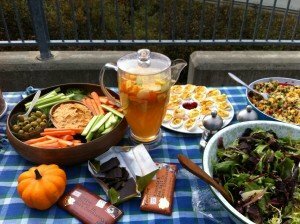 BUT it is also the perfect venue for a big roastarama with fall root vegetables and, say spicy chunky peanut dip or butternut squash hummus (coming soon). When you bring a big platter of roasted goodness with a few dips you won’t get hunted down at middle school but people will be psyched nonetheless. So here it is. It works well as muffins but grease and flour the cups well or make your life easier and use liners. The only other note is to beware of addiction, as this almost crosses the bridge from bread to cake. Preheat the oven to 325°. Butter and flour a 9-inch square glass cake pan (or up to 18 muffin cups.) Whisk together the flour, corn meal, baking powder and salt in a medium bowl and set aside. In a mixer, cream the butter and sugar. While the mixer is running, add the eggs one at a time, beating well after each addition. Add the corn, pineapple and cheese and mix to blend. On a low speed, add the dry ingredients and mix until blended well. Pour the batter into the prepared pan and bake until golden brown around the edges and a cake tester stuck in the center comes out clean, about 1 hour, checking at 50 minutes or so for doneness. (If your pan isn’t quite deep enough to hold the entire batch, just pour the extra into a muffin tin or mini loaf pan. If you’re making a double batch you can use a 9″ x 13″ pan and a smaller square pan. These are a tad sticky, so if you are transporting muffins and not using liners be sure to separate each layer with parchment paper or plastic. 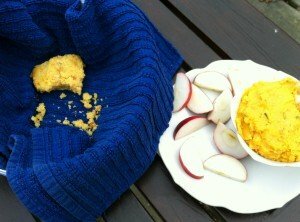 Cornbread shrapnel–that’s what you get if you turn your back before taking some. This entry was posted in Breads on October 16, 2013 by Edie Morgan. I turned 50 last Wednesday – GULP! The actual day was a lot of fun. I heard from many friends and family, wishing me well as I embark on the next half century. For those of you close to this milestone, fifty is not so bad. It is a rite of passage….. a new decade…..a fresh start. Everyone tells me life just keeps getting better so I say – BRING IT ON! How does this milestone birthday involve my blog? 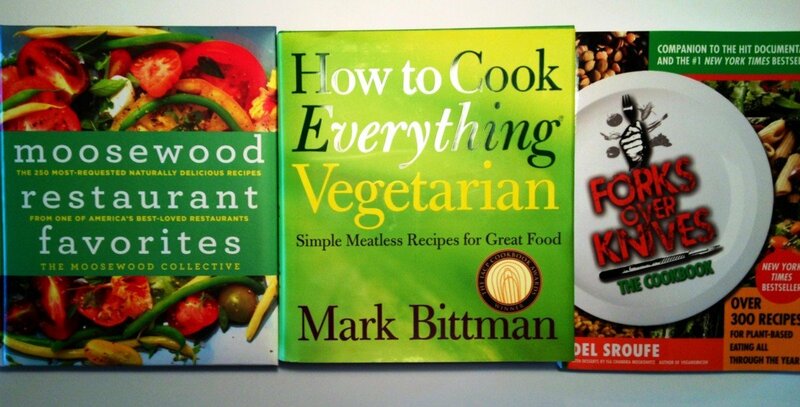 Well, I’ll tell you…..I got three awesome vegetarian cookbooks (do my friends and family know me or what?). I am practically giddy! So, stick with me vegetarians, partial vegetarians, and non-vegetarians because there is something here for everyone. Check them out! 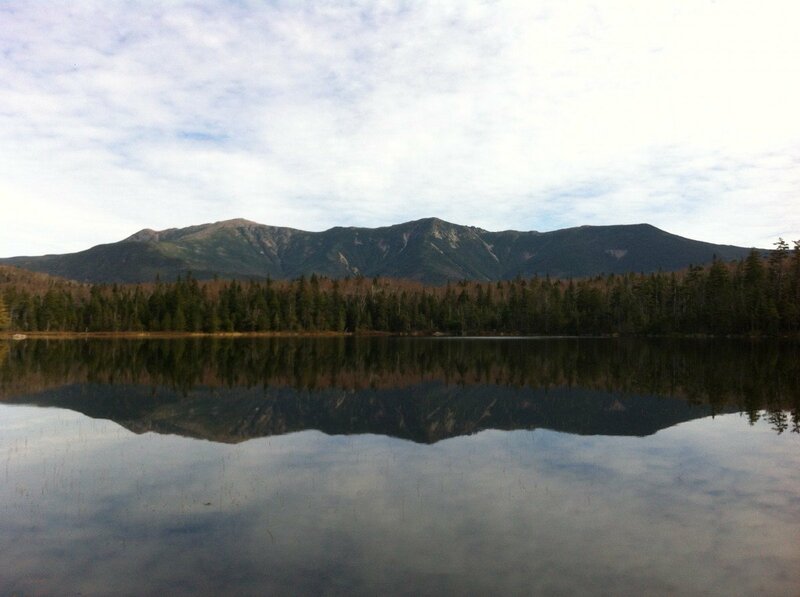 This entry was posted in Uncategorized on October 14, 2013 by Sue Hanlon. What we really want to do with apple pie, right? 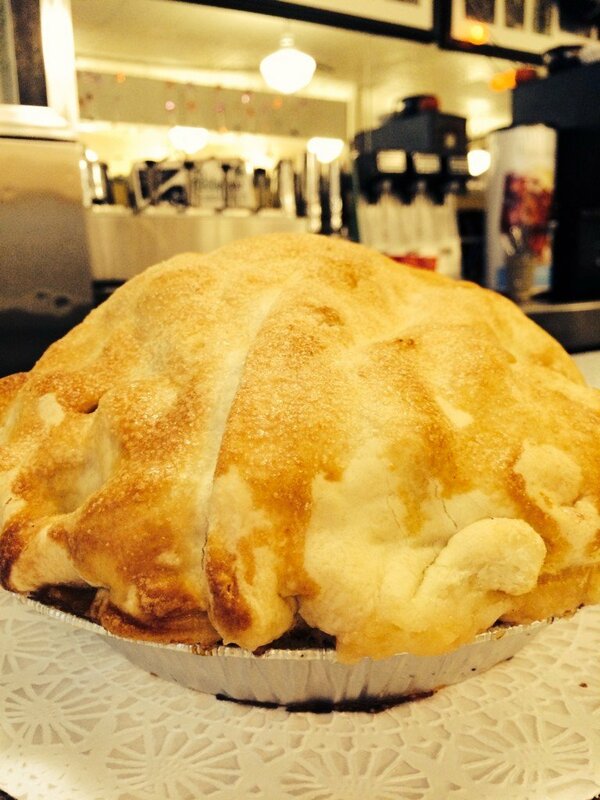 As apple season comes to a close it would be a crime to miss the topic of apple pie. And it would be more of a crime if you did not make an apple pie because you were daunted by making the crust. Despite what the aggro bakers say, it is not a crime to use Betty’s little helper, the refrigerated roll-out crust. I’ll never reveal them, but I know bakers at the highest level who resort to the Pillsbury solution on occasion with no damage to their reputations. Obviously, I skipped the homemade crust. I used pears and apples, did not peel them (they’re organic fergawdssake), and grated half the apples before I realized I had the wrong blade on the cuisinart. I subbed maple syrup for the apple cider syrup, used flour instead of “pie enhancer,” and subbed cinnamon and ginger for apple pie spice. Alright already! Here it is, and it was outstanding. Your favorite refrigerated roll-out pie crusts. To make the crust: Take the box out of the fridge and let it warm up a bit. Baking: Place the pie on a baking sheet to catch any drips. Bake in a preheated 425°F oven for 15 minutes. Reduce the heat to 375°F, and bake for an additional 45 minutes, or until the top is brown and filling is bubbly. Yield: 1 pie, about 10 servings. 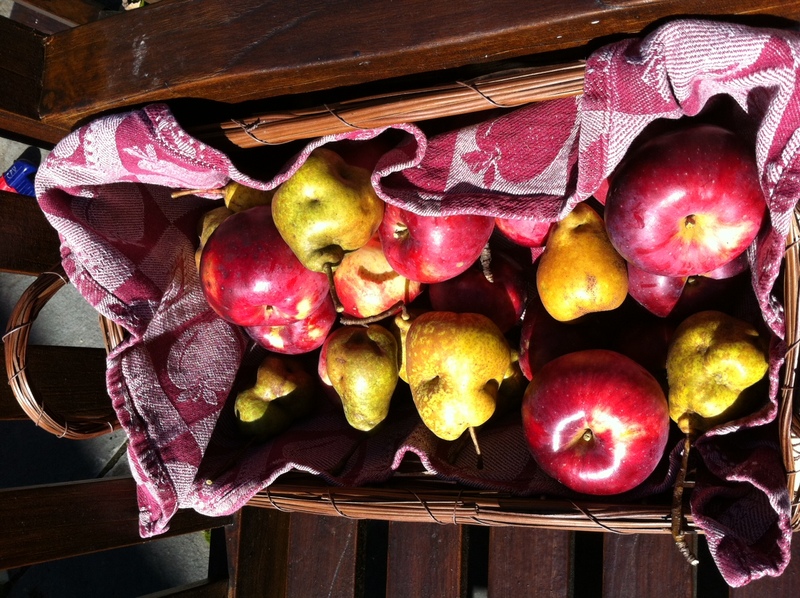 Joni Mitchell apples and pears–not the prettiest, but darned tasty. This entry was posted in Dessertalicious on October 10, 2013 by Edie Morgan. Beets add color, flavor, and a bit of a kick! Sweet potatoes are everywhere! They can be found in your breakfast, lunch, dinner, dessert, and even your smoothies. This is great news because sweet potatoes rock if you are looking for Vitamin A or Beta-Carotene. So add this to your repertoire of healthy stuff to bring to pot lucks, etc because many use those events as an excuse to haul out the unhealthy heart attack food. This sweet potato recipe is a side dish that might be perfect on Thanksgiving, especially if you’re trying to get away from that sickeningly sweet side dish of sweet potatoes with marshmallows (who likes that dish anyway?). This recipe comes from Terry Walters of Clean Food. For this version I added grated beets but that is totally optional. Enjoy! In large sauté pan over medium heat, sauté ginger and onion in olive oil until soft ( about 5 minutes). 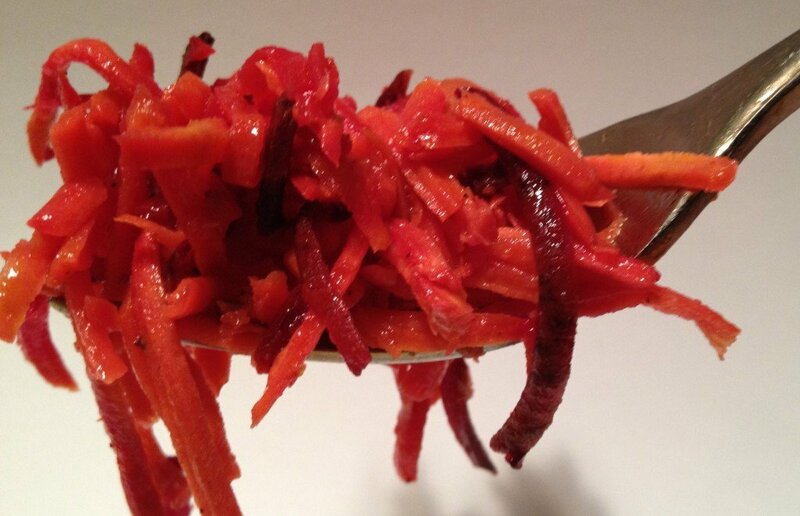 Add shredded sweet potatoes (beet if using) and lime juice, and increase heat to medium-high. Stir continuously and sauté 5-7 minutes or until sweet potatoes start to soften. Season with nutmeg, and salt and pepper to taste. Cook a couple minutes longer. Voila! This entry was posted in Salads and Sides, Veggie Delight on October 7, 2013 by Sue Hanlon. To balance all those healthy paleo and endurance crackers, I present to you a very unhealthy form of crack…er. This is ridiculously yummy and easy. Healthy? Not so much. Somebody brought a batch of this to book group and warned of its addictiveness. I started giving it as a neighborhood holiday gift and it quickly became an all-season, all-occasion favorite. 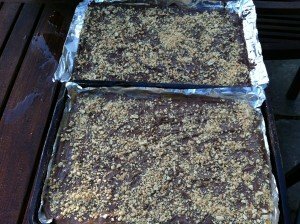 It makes excellent bake sale material (which puts it in the Positive Snacks category), is darned good on a hike (add it to Better in a Backpack) and is a huge hit with hungry, sports-playing teenagers, who inspired the current batch. Child Labor–Happy and ready to spread. And on the topic of kids, they can help you out here. 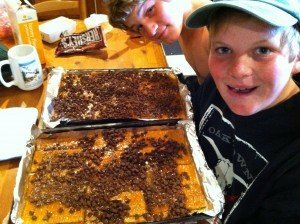 They love the process of making it, especially spreading the melted chocolate chips (Hello bake sales!). 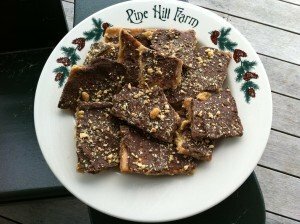 It’s equally good with saltines or graham crackers, so use what you prefer or what is in your cupboard. These were introduced to me as “4th of July Bars” but the name did not stick. You do need to crack them to break them into pieces. And they’re made with crackers. The fact that they are as frighteningly addictive as something with a similar name is purely coincidental. 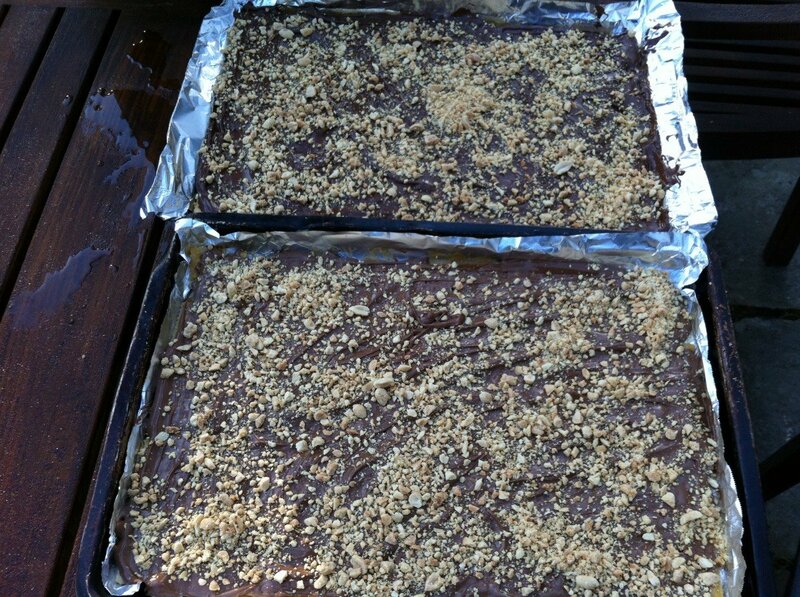 Have ready a 13 x 9 pan: foil lined and lightly greased. Preheat oven to 400 degrees. Combine sugar and butter in saucepan. Bring to a boil and boil for 4 minutes exactly – no more. Pour boiled mixture over the crackers. 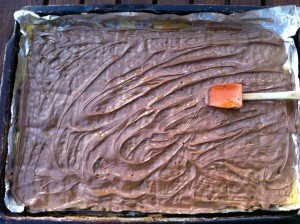 Bake for 5 minutes – no longer! Remove from oven and while very hot scatter the chocolate chips on the surface. Spread chips out evenly as they melt and soften. Scatter with chopped nuts. Refrigerate until hardened. Then cut or break into pieces. Store in a gallon-sized ready to tote ziploc bag in the fridge, or in individual plastic baggies that you can dole out as necessary. Make it fancy with tissue paper and a ribbon. This entry was posted in Dessertalicious, Positive Snacks on October 4, 2013 by Edie Morgan.